Around the Bangkok temple grounds were many eating places. We rested for a little while in the shade of one of the larger trees and ate our sliced ice cold pineapple which we bought on the temple grounds. When four Buddhist novices passed by, I asked them to take a picture of us together. They were very shy and didn't talk at all but didn't mind having their picture taken. There were some Thai girls on the temple grounds all dressed in their beautiful Thai costumes. They looked so colorful that there was no way I was going to miss their picture. We took several group photos with them. We had all the pictures we wanted and saw everything on the temple grounds we wanted to see, so we took the boat across the river again. 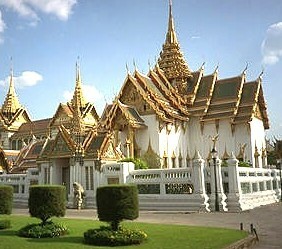 Our next visit was to the "Royal Grand Palace". This place was even more fascinating than the temple grounds we visited before. Most of the buildings here were gold leafed. There were so many temples with different Buddha statues. In one of the temples the side door was wide open and I saw a golden statue of a Buddha surrounded by many candle lights. The temple was filled with young monks who were meditating. It was a very expressive scene with all those orange robes and them loudly meditating. The largest temple on the grounds was the most visited by all the tourists. 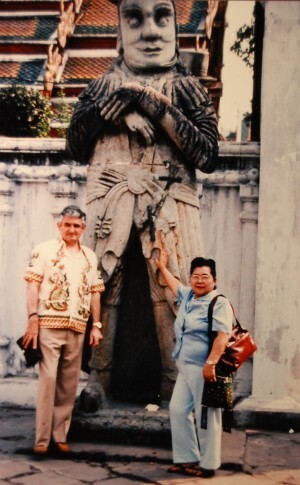 It was called "Watt Tri Mitt" the Golden Buddha building. Inside this temple was a solid gold Buddha statue of about ten feet tall. To enter the temple you must take off your shoes. Inside the temple everything is glittered with gold. I was told that most of the gold was donated by the Thai people as offerings. It was very interesting visiting all those temples and seeing ways of culture which are so different from ours but give them their comforts in their daily lives as we have in ours. We did a lot of walking to visit all those temples, and after that Lu Lu became very tired. We decided to go to a restaurant and have a little snack. Zep took us to a restaurant where the food had a Thai-Burmese entree. This way we spent some time in the restaurant and Lu Lu could rest her legs. We thought we would have a little snack, but once we were in the restaurant our snack became a complete dinner. Before the main meal came in I ordered a bowl of soup. To my surprise the soup was prepared in front of me in a stone bowl on a small fire. I don't know what kind of spices they put in that soup but it took me several cold glasses of beer to cool off again. All the different kinds of Thai beer I drank were very good. The food bill in this restaurant was much more than the one we received the previous day in the Chinese restaurant. The bill this time was $35. After our hearty lunch we took a taxi and did some sightseeing around the Kings Palace. I noticed many soldiers around the Kings Palace, guarding all around the Palace grounds. The gardens around the Palace are well kept, and the beautiful flower arrangements are very nice. The heat and pollution in the air and driving around in this city with all the traffic mess made us retire a little earlier than we had planned on our sightseeing tour. Lu Lu became very tired and she wanted to go back to the motel. After a nice bath we felt much better. I asked the maid who cleaned our room to massage Lu Lu's legs for a little while. For a small tip they do anything you ask them to. The maid who cleaned our room was very nice and honest. She told us she has two little girls at home which she had to take care of. The little girls were going to a Catholic school. The maid told us that she made 100 baht a day. That was about $5 U.S. dollars. We tipped her daily because she took care of our laundry and so many other things. She had to work very hard because she didn't have a husband. I told her to bring the girls along one day. She did, and I must say, they were two great little girls. She must have picked them up from school as they were still wearing their uniforms. I noticed that one of the girls soles came off her shoes. To go to a Catholic school the girls had to wear a school uniform. So I told the mother that the girl needed a pair of new shoes. She told me that she couldn't afford to buy the girl a pair of shoes right now, it would take too much from her pay. I asked her how much a pair of new shoes would cost for the little girl, and she told me 90 baht and she was only making 100 baht a day. I felt so sorry for her and her daughters that I gave her the money to buy a pair of new shoes. The little bit of money those people make and they are so honest. There were many valuable things in our room and during the day we were always out. During the morning when she was cleaning, the door was always open. She could have stolen some of our things. Sometimes I left my camera in my room, but nobody ever touched it. Those people have so little and yet they are so honest. In just a few days Lu Lu became very familiar with the neighborhood. She already made friends with some of the staff and the owner of the motel. Lu Lu is not a late sleeper and gets up very early in the morning. You couldn't keep her in the motel for long as the delicious cooking aromas early in the morning from all the small eating shops in the neighborhood made her eager to get out. Lu Lu would buy some fried fish and take it back to the motel and have it with her rice together for breakfast. Some mornings I would walk through the neighborhood. It was always crowded on those narrow streets, but there was always something interesting going on. People have their little open eating places on the side of the road. You could smell the aromas of fried fish, and some were roasting a piglet on an open fire. The roasted piglet looked so good that I couldn't resist buying a piece of it. I ate a small piece of it and the rest I gave to our maid.